Jill Rappaport is an award-winning animal advocate, network journalist, and best-selling author. Jill was a correspondent for NBC’s TODAY for 22 years, creator of the “Bow to Wow” rescue television series, and author of the books “People We Know, Horses They Love”, “Jack & Jill: A Miracle Tail to Tell” , and “500 Cats”. She also has a hit line of toys and pet products on QVC all benefiting shelter animals. Jill was the creator, Executive Producer, and host of NBC’s “Best In Shelter with Jill Rappaport”. And Jill is the host and consulting producer on the ground-breaking rescue/adoption show “The Dog Bowl” on Animal Planet. 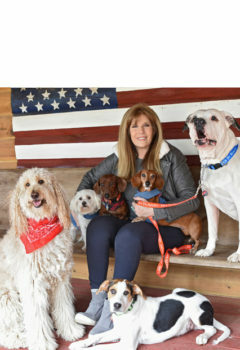 In addition to being a passionate advocate for all animals, Jill lives on a farm with her own 6 rescued dogs and 6 horses.